The day was cold with a threat of rain , the start was delayed by 3/4 of a hour, as usual. 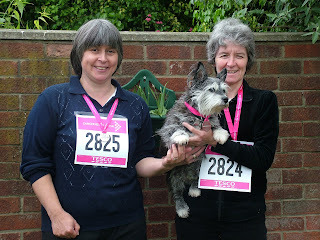 I had begun to turn blue, literally, we did the warm up, well I did the best I could , then we went to the start line. The horn went, we were off, I was told I could walk about a mile by Wietse, [physio] and the spies would be out checking. I walked the first 1km slowly, with a lot of shoulder pain, most people were over taking us. 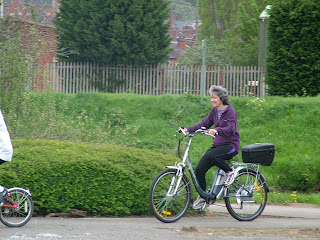 Then I rode in the wheelchair, Bev went very fast and caught up with most that had passed us earlier. Lincoln and District were marshaling, so we had plenty of support and comments, I rode for about 3 + km then walked the rest . We finished in 55 min 30 sec, we thought we did very well. We were given a medal, a goody bag with various toiletries and other bits, all so the rain held off, so nobody got wet, just cold..
About 4000 ladies/girls took part, all remembering past and present loved ones that have been affected by cancer. I think most of them enjoyed having a chance to do something for such a cause, including me. Having a lot of cold and hot spots still getting spasms but not as bad as be for, mostly in neck causing my head to tilt on one side and giving me bad head aches, all so spasms in legs. Have not had a bad full body one for about a week. Night time sweats have bean worse lately, I wake up sweating like mad but shaking with cold very strange, could this be any thing to do with the warmer weather must ask wietse. Went back to running club [LDR ] with the beginners. To start with we went down Station Rd this is where it all began nearly 4 years ago [ when I fell and got RSD] I felt very sick and not too sure I wanted to go on, but I over came the nerves and peddled on, the run was OK but felt very strange, mixed feelings beaning on a bike instead of running,was weird. Weiste put needles in hands and ears hands were very pain full and hurt going in and out ears OK. They still hurt a week later,I kept dropping things more than usual electric shocks and hand felt like foam told Wietse ,the next session he only put needles in my ears. The big news, he was able to massage my RSD foot it hurt, but I was able to stand it, my foot tried to spasm up, but he kept on massaging it, by the time he had finished, I felt very hot and sick. I sat for a while he asked me if I was all right, I said fair, no physio next week as Wistse is away.He said see you in 2 weeks be good. The next day a big bruise came up on my foot it felt very tender & sore. After a few days my foot felt a lot better not as stiff and swollen so he might have done some good, lets hope so. I said I would do a bike ride to raise money for the MS, this is where I have my tank sessions[.On hold at the moment],I only decided the night before to do it, as the last few day have not bean so good.. I biked to the start and was told it was approx 18 /19 miles round trip,we all set off along the bike path which was very nice no cars, on the way we saw 2 large metal cows and a giant fish [this is all before the pub] and lots of wild life. we reached Bardny and went to the pub for dinner and half a shandy my legs ached a bit. After a rest we started the ride back it seamed a lot easier going back, lots to see on the way back all so, a very nice ride the weather was lovely. We arrived back in Lincoln very tired but pleased I had biked about 22.5 miles in total [inc ride there and pub detour] was really pleased with my self no electrics all peddling. For a few days after I ached but not too bad. You hurt if you do nothing so you might as well hurt for a reason, shoulders hurt the most along with my foot. No pain no gain [Mark]. 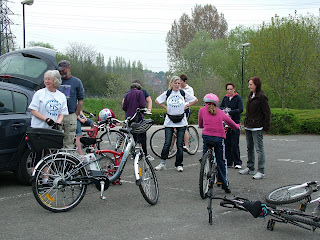 Another session went with the fast group to night found it better was able to keep peddling at there pace it went very well.We went round one of the parks Whisby it was a warm night I really enjoyed it, all so there were more people I knew. That night I peddled nearly 14 miles no electrics all Gill power. Another mixed month of pain but I am fighting back.